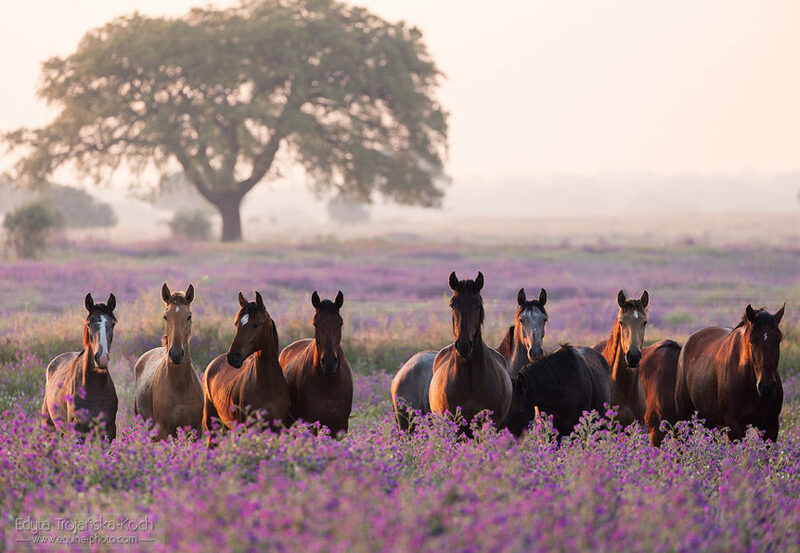 During my travels, I meet horses which remain in my heart forever, people with whom we understand each other without words and places I fall in love with at first sight. Coudelaria Santa Margarida is one of them. I first came here four years ago. 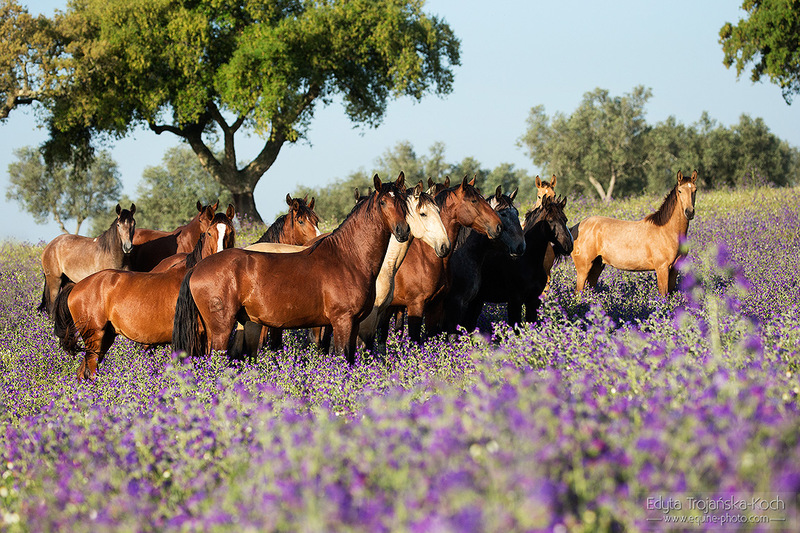 I immediately was charmed by endless meadows, wide cork oaks under which horses look for shadow on hot days, white-red buildings like in fairy tales and all-encompassing peace. Unfortunately, the weather was not very kind for me during my last visit and I knew that some day I will have to come back. While planning a spring trip to Portugal this year I added Santa Margarida to the list and due to unforeseen circumstances I spent there almost a week, instead of planned just two days. Probably nothing better could happen to me. When I pulled on the dusty road leading to the farm Monte de Sernadiha instead of watching potholes appearing ahead of my car, I was looking around in silent awe. Perhaps due to exceptionally rainy spring, maybe because this time it came a little bit later, or perhaps for some other reason unknown to me, this year the meadows flourished with such palette of colors that it reminded Impressionist paintings. 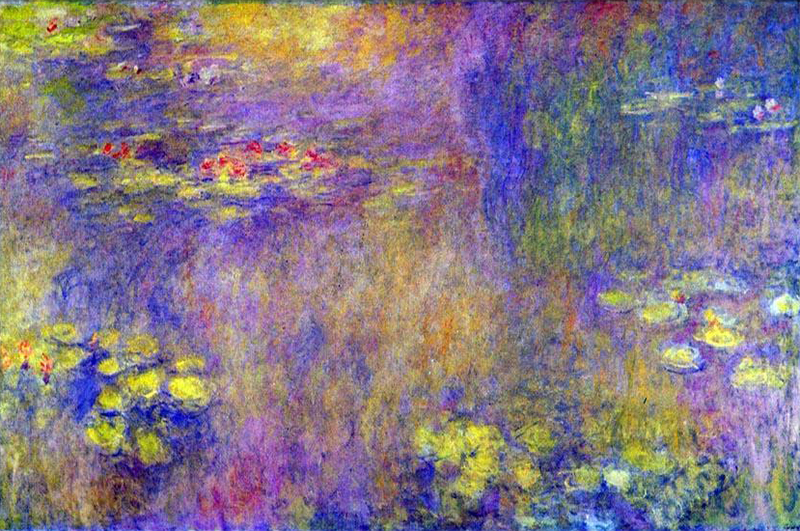 Monet certainly would be delighted. For some time I have been dreaming of a photoshooting in a lavender field and here in Portugal I found a lavender field, without lavender. The violet dominate all the landscape with a little bit of white and yellow, as if to bring some variety. In the light of the rising or setting sun the colors really make you feel dizzy. 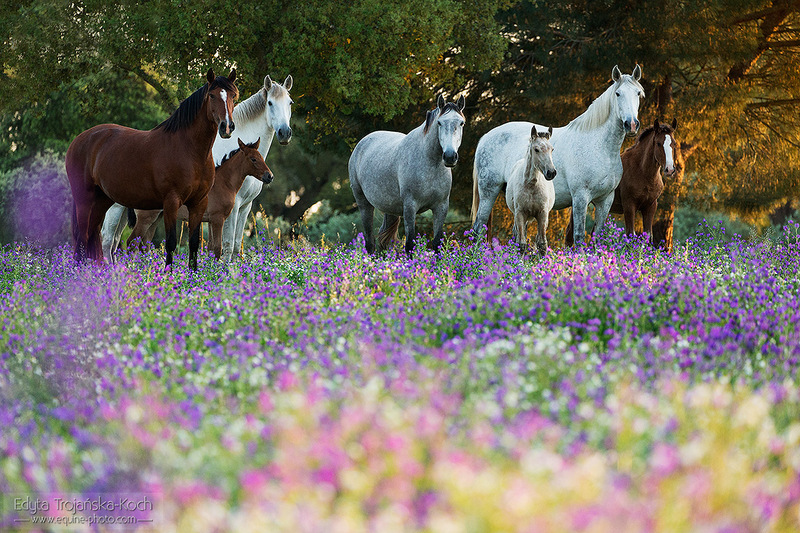 Of course, my happiness would be incomplete if there were no horses in this fairytale landscape. I must say horses are really phenomenal here. 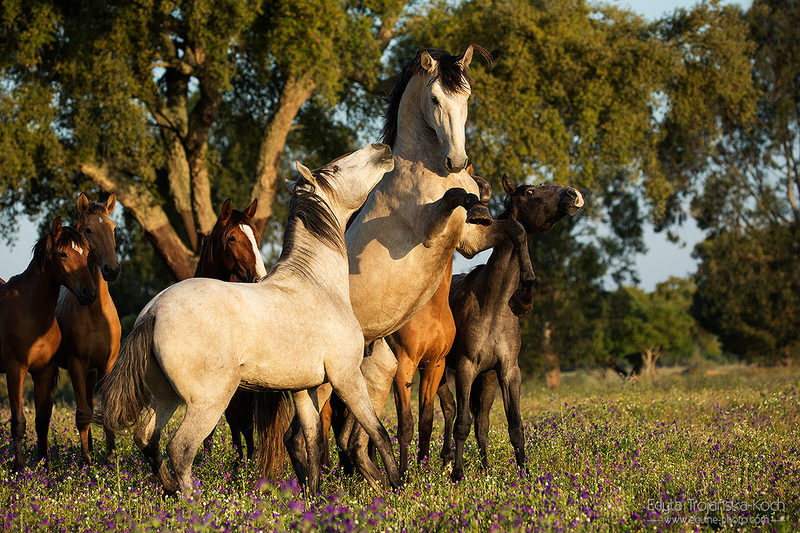 Santa Margarida is one of the most renowned Portuguese breeders of Lusitano horses – it repeatedly won the title of the best breeder, both at domestic and foreign competitions for horses of this breed. 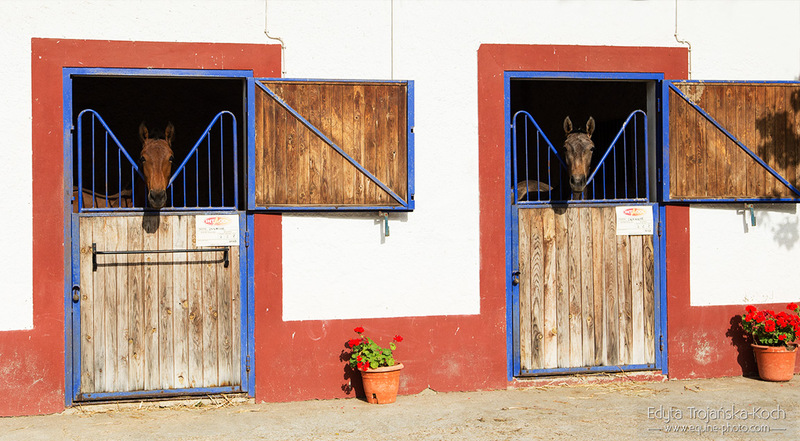 There is no one who don’t know two outstanding stallions Spartacus and Campeador bred by Santa Margarida. 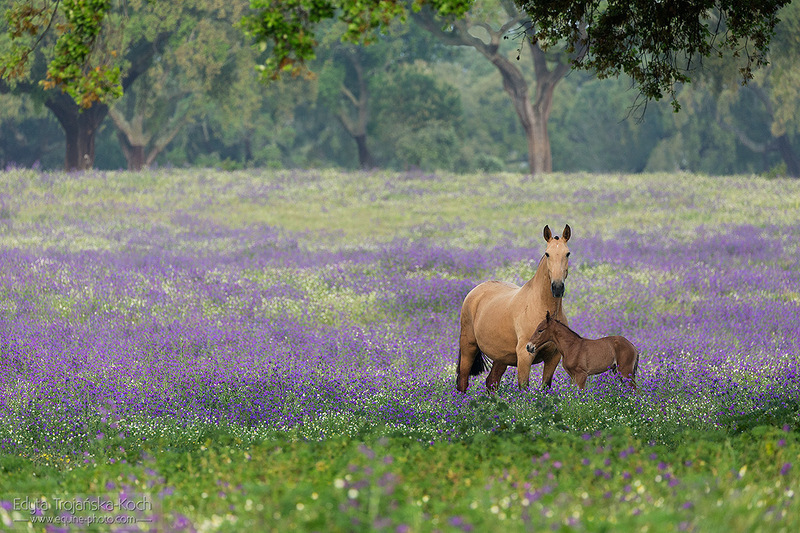 Every morning I faced a dilemma, to which of the four herds go first, to mares with foals (and if so to which one of the two different groups), to colts or to fillies. The choice was difficult, fortunately it was impossible to make a bad decision. This is one of those rare situations whichever choice you make, it’s always a very good choice. 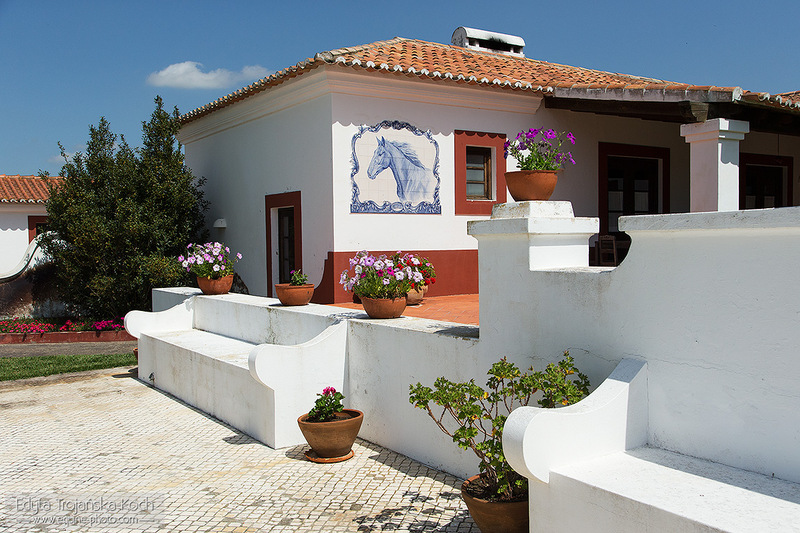 In addition to the wonderful horses and breathtaking views, it would be a crime not to mention here the charming hosts Piedade and Luis Pidwell, who are really passionate people and their knowledge about horses in general and Lusitano horses in particular is admirable. 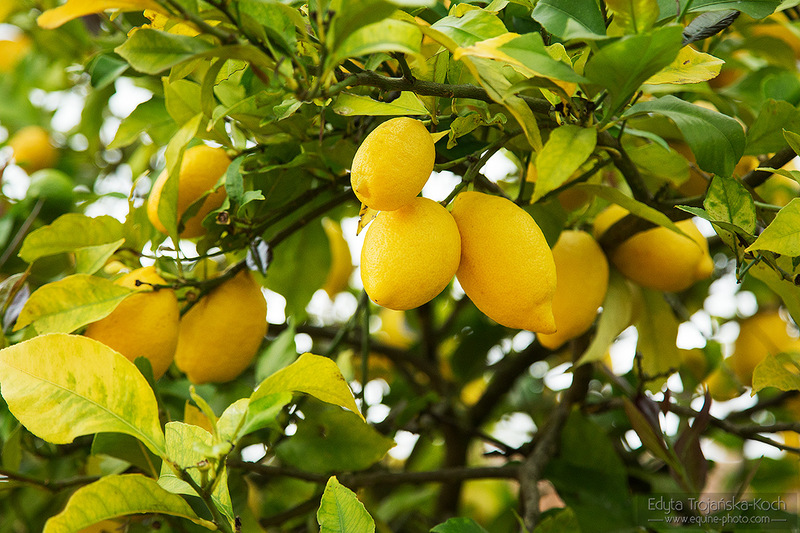 Furthermore, there is an abundance of small pleasures, like a lemon tree peeping through the window, sprinkled with ripe fruit, many colorful flowers among buildings and hovering in the air, sweet smell of hot summer, incomparable to any other (although according to the calendar, it was still spring). Although I was leaving Sarnedinha with the hard disc full of fairy-tale pictures, I was still feeling unsatisfied. I knew I could have done much more. Hopefully, I’ll be able to come back to this amazing place next year.